Celebrating Mother’s Day with Alicia Souza! Summer is a fun time for most children, it is a time for leisure and play. It is a time to indulge in activities that most children enjoy like swimming, cycling and of course playing with their friends outdoors. But for children with eczema, the changing of the season can be a difficult time. Whether it is the change from summer to winter or a transition to the summer season, eczema flare-ups can occur if proper care is not taken. In any case, managing eczema is challenging at any time of the year. For children with eczema though, summer can be especially hard. Whether, its an adult or a child, measures taken proactively can minimise or even prevent major eczema flare-ups during the summer season or at the very least reduce the frequency of their recurrence. This is of even more importance in a tropical country like ours where both heat and humidity is quite high in the summer months and peaks in the monsoon thereafter. Sweat is a big trigger for eczema. Our human body produces sweat which naturally contains minerals and any build up can irritate the skin. This is especially true for those areas where they accumulate like the back of the knee, inside of the elbows and the back of the neck. Make sure that your child is wearing 100% cotton clothes at all times and ensure that the sweat is wiped off as soon as possible. Making sure that the body is kept cool with the help of a fan and air conditioning really helps. Also, sweating which is inevitable due to outdoor play or even while travelling can be managed by using wet towels and rinsing off the sweat which helps prevent/reduce the itching. Ensure that your child is drinking enough water and juices (fresh ones and not sugar laden artificial beverages) so that the loss of water due to perspiration is taken care of and the body is properly hydrated. Proper hydration is important at all times and is even more important during the hot summer months. If possible, help your child keep track of their water intake by giving them separate marked bottles. Most type of physical activities which our child enjoys can be beneficial both for physical as well as mental health. This is especially true during the summer as we pack our bags and head to the beach or the mountains or even if we stay off vacation spots for that matter. Swimming is a favourite activity for most children during the summer break and they should be able to enjoy it. But if your child is in the middle of a bad flare-up and has open wounds, this is not the right activity at this time. Other than that, if you are at a beach, sea water is good for eczema since the combination of sunlight and sea waters works really well for most people. Seawater has antiseptic properties and also other minerals which are beneficial for the skin. Again, too much of exposure at one go can make the skin too dry, so once again exposure should be in short bursts of 15- 30 minutes depending on the skin condition. But whether it is the exposure to the chlorinated swimming pool or sea water, skin tends to get dry so a shower followed by proper moisturisation is a must post the activity. In any case, the chlorine from the pool and the salt from the seawater respectively needs to be rinsed off as well. Also Read: What does Eczema look like for a child? 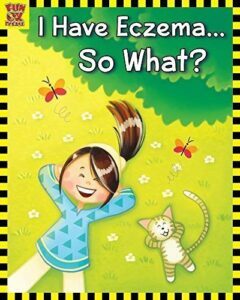 Book Review: I have Eczema; So What? Moisturisation is key to managing eczema. Depending on the dryness of the skin, your child’s skin will need to be kept properly moisturised at all times. This is especially true after swimming activities whether it is in the pool or the sea. You can opt to use a skin friendly, non-toxic, non-fragranced lotion or plain old coconut oil (this works really well). I prefer to use organic, cold pressed coconut oil for my daughter and it works best on moist skin before patting dry with a towel. This helps seal in the moisture for a longer time period. Any chronic condition can get aggravated by stress and eczema is no different. So by making sure that your child is enjoying himself or herself in the summer and has a lot of downtimes can go a long way. Playing with friends, indulging in activities that they love and spending quality time with you can go a long way in bringing down their stress levels and managing flare-ups. Last but not the least, your child’s diet will play an extremely important role in managing eczema. Your child should be having plenty of water, coconut water and fresh juices so that the skin stays nourished and well hydrated. Focus on fresh and wholesome foods like fruits, vegetables preferably the ones which are seasonal and thus have the maximum nutrient content. Foods rich in omega 3 like nuts (in case there are no allergies), seeds (flax pumpkin and sunflower seeds), fish (for non-vegetarians) play a big role in managing eczema from within. As a mother of a daughter who used to suffer from extremely severe eczema, life has taught me many lessons. One of the most important lessons that I have learned over the years was that it was really necessary to notice and enjoy the little moments of joy that come our way. It becomes even more important when we are dealing with a difficult situation like a health crisis. And if you are a parent of a child with health issues, it is really easy to get overwhelmed with all the things that need to be done. There are medications to be given, steps to be taken to keep your child comfortable, doctor’s visits and countless others which can in a way take over your life. We need to pause from time to time, take a breath and look for moments to connect with our child. They need us to see them as a person, which is much more than the label “eczema” that they may end up wearing on their sleeves. Summertime (and any other season for that matter) can then truly become a precious memory that your child treasures from their childhood and eczema remain just one small part of it. Anindita is India’s first certified Functional Medicine Health Coach from the US-based Functional Medicine Coaching Academy (FMCA). She is also a first-time author and has written a book called “I have eczema…so what?” She writes a blog called “eczema-anindianperspective.com” where she shares information and also provides a form of support to others suffering from eczema. She currently has her own coaching practice and will also be setting up the first Functional Medicine based clinic in Mumbai beginning of next year along with Dr Amrita Talwar, her co-author and her daughter’s dermatologist.